The StateMachine Diagram is one of the Unified Modeling Language (UML) Behavioral diagrams that can be used to model the important phases in the lifetime of an element. It is often thought of as a diagram for technical uses but it has equal applicability for non technical audiences. 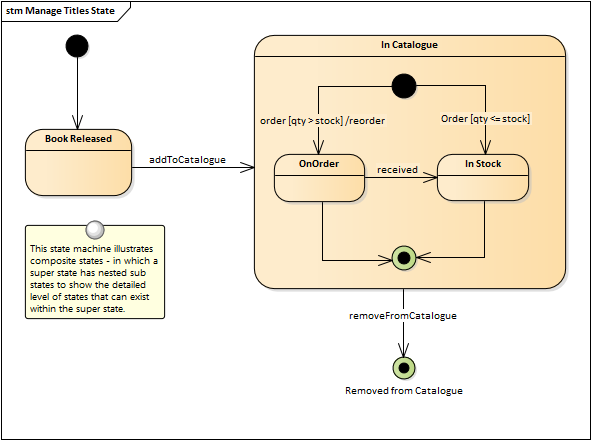 The StateMachine is defined for a selected entity in the system and a perspective is defined that will be modeled by the States and other elements and connectors in the diagram. The StateMachine diagram is used to model the important phases in the lifetime of a system entity. It can be used to model business entities such as Bank Accounts or technical entities such as a Traffic Light Control system. The StateMachine diagram can be automatically converted to an analogous model in a State Table Editor. This can be an appealing representation for some users and the editor provides an easy to use interface to add new States and Transitions. StateMachine diagrams and Tables can be used to create Model Simulations that will allow the modeler to visualize, explore and test the dynamic behavior of the StateMachine. StateMachines can also be used for to generate code into Hardware Description Languages (HDL). The StateMachine Diagram (like any diagram) can be viewed as an element list which makes working with the element's properties easier.